The icy sleet angrily pecked against the glass windows as I picked up the ringing telephone. My greeting might not have been so cheery had I known an operator with the state highway patrol was on the other end of the line. “There’s been an accident…” she started. I swayed against the door frame to the living room, watching my three-year-old daughter and her older cousin playing on the floor. I dropped to my knees on the floor, even as I looked quickly out the window to the front porch, expecting to see a state trooper slipping up the icy sidewalk. But he’s all right, I thought to myself. They wouldn’t call if he wasn’t all right. Someone would come here to tell me. I forced my attention back to her words. Emergency crew cut him out. Trooper took him to a gas station to wait for someone to pick him up. He’s okay. I kept telling myself as I called my dad. It took a while to get to Kevin that icy, snowy day. My grandmother came to stay with the girls while my dad and I slowly drove the treacherous roads for an hour to the gas station where I flung open the truck door and threw my arms around my still-shaken husband. Ten minutes later, when we drove into the wrecker’s parking lot, I could see why. His blue Explorer was totaled; smashed in doors, broken glass, outside mirrors hanging at crazy angles. We silently filled plastic bags with the bits of our life that survived the crash and walked away, thankful that he’d survived. When the shock wore off and we could joke about it, I teased Kevin because I’d actually been up for the next new vehicle at our house. “Wrecking your truck? That’s kind of a hard way to make sure that YOU get the next new car, not me,” I told him. But I laughed because I didn’t really care about the new car, as long as I still had Kevin. A few weeks later, after insurance claims had been filed, Kevin went looking for his new vehicle. He found a 2005 Dodge Durango, bright red, low miles and, with our insurance check and a little bit we’d squirrelled away, it was the right price. It was the base model – no frills, no bells or whistles – but it got us where we needed to go. Kev loved it; it drove a little rough for me. I told him it was like riding in a feed truck across a bumpy field, a comparison my city-bred husband didn’t really get. I think he liked the bright red color because it felt so alive. Just a couple of months before his wreck, Kev’s oncologist had okayed a little break from the chemo that was fighting the colon cancer’s unrelenting spread through his body. Kevin had been through a lot over the last nine months – diagnosed with cancer, two surgeries, six months of chemo – and being able to walk away from that smashed-up Explorer made him realize that he had a lot to live for; the cancer hadn’t gotten him, and the wreck hadn’t killed him. He was supposed to live. We piled our luggage into the Durango early one spring and headed to the airport. Destination: happiest place on Earth. And, at the end of our Disney week, the truck welcomed us back, funny mouse ears and all, and got us back to our real life. We went to baseball games and amusement parks and church and work and the zoo and museums, and the Durango safely got us there and back, always up for whatever kind of adventure we were in the mood for. We sang along one summer as Frank Sinatra blared from the speakers, “My kind of town, Chicago is my kind of town” and Beary passed bottles of water and cans of soda from the cooler by her side as we road-tripped to the Windy City for a conference. The following spring, I loaded the cargo area with Kevin’s oxygen concentrator, portable oxygen canisters, a wheelchair, our luggage, and Beary’s beach toys and we drove sixteen hours to Orange Beach, Alabama, so he could watch our girl play in the ocean for the first time. It was our last family road trip. Just a few weeks later, I drove the big, red, rough-riding Durango home from the hospital, with Kevin in the front seat. I winced at each bump, anxious not to cause him any extra pain. My dad sat squeezed into the back seat, ready to reach out and catch Kevin if he started slumping, or if he passed away on the way home, a fear my dad and I didn’t voice to each other, but felt every mile of the way home. We’d spent the night in the emergency room and, when morning came, our doctor told us time was short. I drove with one hand on the wheel and the other on Kevin’s arm, needing to touch him, keep him with me, get him home safely because I’d promised him I wouldn’t let him die in a hospital. He died the next afternoon, laying by my side in our bed. The truck sat in the garage for a week; in my grief, family and friends drove me to the places I needed to go. But one day, I climbed into the driver’s seat again, and my girl fastened herself into the seat behind me, and we drove Daddy’s truck to the store. Then to church, and the park and soon, we drove Daddy’s truck everywhere. It was a way to keep him with us, to remember him seated behind the wheel, music blaring, taking us to another family adventure. We drove it to the airport, so we could get back to Disney’s magic and remember Daddy again; we drove it on the long road trip back to the beach, to be in a place of wonderful memories on the second anniversary of his death. We drove it and drove it to the zoo and museums and baseball games and amusement parks and took Kevin with us everywhere. Two years went by and the odometer ticked steadily and I knew it wouldn’t be long until we’d have to give up the Durango. I started looking around, searching for the minivan I’d been wanting since before Kevin’s icy wreck. Finally, six years later, it was my turn for the new car, but it was hard to get too excited about it, because we’d be giving up the Durango. Losing the rough-riding truck itself didn’t bother me; but losing another piece of Kevin, a tangible something that connected us to him and our memories – that was harder. I didn’t know it, but we had one more memory to make with Kevin’s truck. It’s kind of like we saved the best for last. I don’t know what my girl will remember about her childhood, but I hope she remembers the night that I woke her up at 11:30 and drove eight miles out to the middle of a bean field in the country. We layered blankets on the hood of the Durango, then leaned back with our arms crossed behind our heads and watched the stars shoot across the sky. She giggled with delight at the idea of sitting on top of the truck, then said, “I can’t believe we’re part of all that, way up there,” gesturing to the Milky Way spilling out across the heavens above us. We cried out each time we saw a glowing bit streak across the sky and burn out as quickly as it appeared. Me and my girl, on the hood of her Daddy’s truck, feeling him with us, watching God’s fireworks. A week later, I finally traded the Durango in for a minivan. It was déjà vu on the car lot, silently filling a plastic bag with the bits of our life left in the Durango. Beary bounced with delight, trying out all the seating options, and I struggled to maneuver the new buttons and controls. I cried as I turned out onto the street and drove past Kevin’s big red truck, sitting alone on the lot. I couldn’t feel his presence in the minivan and I missed glancing over and imagining him sitting next to me. I wanted to turn around and go back and sit in his truck just one more time, spilling my tears over the steering wheel. But then I remembered what he’d learned after his wreck: We are supposed to live. So we will. My girl and I will keep on, because that’s what he wanted. We’ll take our new minivan and make some new memories. We’ll go on road trips and adventures. We’ll drive and drive and drive – to museums and zoos and baseball games and church and amusement parks. We won’t be in Kevin’s truck, but that’s okay – he’ll still be with us. 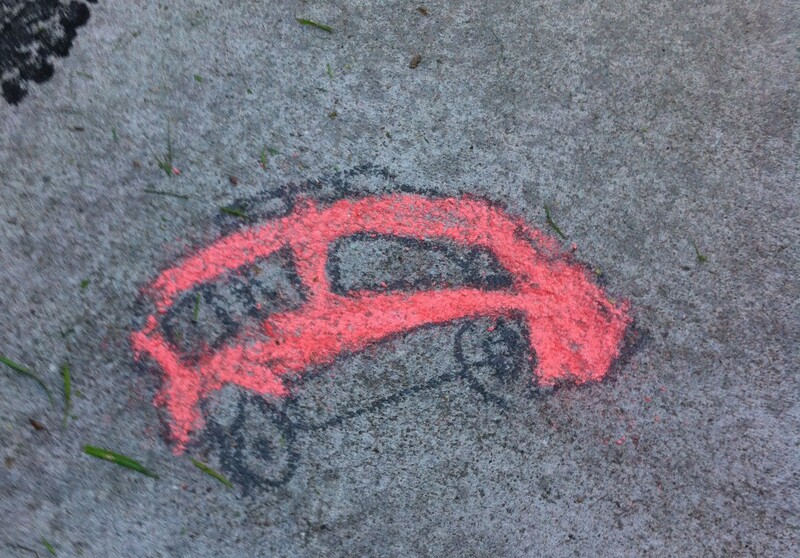 My girl likes to make chalk drawings on our driveway. This is one of my favorites: Daddy’s bright red Durango. I didn’t know that opening that box containing pieces for a new kitchen island would open a box of memories and make me smile and laugh out loud. I didn’t realize, until it was all over, that the slow, tedious, hand-blistering, detailed work of putting those pieces together to create a beautiful, functional structure was the perfect metaphor for the journey through grief I’ve traveled these past two years. I thought I was just finally getting an island for the kitchen. The box was too heavy by far for me to carry into the house by myself, so I cut it open in the garage and started carrying the pieces into the kitchen, one by one. Slowly, a pile grew in front of the refrigerator, the white planks tipping precariously once when a curious Katje tried to navigate their height. I kept carrying and the pile kept growing until, at last, I brought in the last piece and stood for a moment, surveying the mess in front of me. In all the time I’d admired this kitchen island on the website, and saved my pennies to purchase it, I’d secretly hoped that “Some Assembly Required” really meant just installing the shelves behind already-attached cabinet doors. Not so much. “Some Assembly Required” was actually a bit misleading, I thought, once more taking in the piles of pieces littering my kitchen floor. “Total Assembly Required” would be more accurate. She giggled and ran off to play with the cats, and I got busy. I unearthed the directions, and started laying out the pieces in order. For the last two years, my daughter and I have eaten most of our meals on trays in front of the television. After Kevin died, I couldn’t stand sitting at our kitchen table, trying to get food past the grief in my throat, looking across at his empty seat, knowing he’d never smile at me again over a slice of deep dish pizza, or sigh with satisfaction after filling himself with roast beef and gravy. I moved the table and chairs into the basement and convinced my daughter that having our meals as a picnic in the front room would be so much fun. She happily agreed – partly because of the novelty, I’m sure, and probably partly so she could eat a meal without watching tears stream down my face. We’d laugh, then he’d pull up a chair and read the directions out loud and hand me the wrong parts until finally I announced the project was finished. We put together an elliptical exercise machine, a desk and hutch for his office, and all of the Bear’s nursery furniture like that. Just the two of us, apprehensive about all the pieces and hardware, but game for an adventure, for a good laugh, for just spending time together. He was just so much fun to be around. I miss that. I thought I might be sad putting the kitchen island together by myself. I thought the memories would overwhelm me and tears would stain the directions and I’d end up on the floor, just another broken piece among all the other parts scattered about. But it wasn’t like that. I felt happy and content and full of wonderful memories and even when I accidentally put a section together upside down and had to take it all apart, I didn’t get frustrated. I felt peace, I felt assurance. Sometimes I catch myself writing the date and I wonder how it can possibly be almost two years ago that Kevin died. Time is so weird and relative and fluid; it feels like it was just yesterday, it feels like it’s been a lifetime. And I still stumble through the hours and days and weeks and months, feeling broken, feeling unhinged, feeling like I will never be able to fit together all the bits and pieces of my shattered heart. My life couldn’t be more disassembled than that kitchen island scattered across the floor. The kitchen island is complete now. It looks lovely and solid and functions perfectly. And my life? My journey with grief? Well, that will never be completely finished; I know that. I love Kevin and I will miss him every day for the rest of my life. But through the grief, through the tears and the excruciating pain of loss, through the cries to God and the whispers of joy, through the laughter of my girl and the silence of the lonely nights – through it all, I’ve been picking my way through and sorting things out, putting the pieces of my life together, fastening them with moments of peace and bits of happiness. It’s starting to come together. Lyrics from “The Untitled Hymn (Come to Jesus)”, sung by Chris Rice. I heard her clear little toddler voice ring out behind me as I stood at the kitchen counter, doing dishes. I turned around to find her decked out with seemingly every bit of finery her dress-up box contained. “It’s time for the wed-ding!” she sang out, like our kitchen was a Broadway stage and I was in the back row. She turned on her plastic high heels and clomped off to the front room. I followed and found Kev, sprawled sideways in his recliner, with a questioning look on his face that I’m sure matched mine. “Okay, Mama, you have to say the words so I can marry Daddy,” our little Bear announced. Kevin smothered a snicker with a cough and a pillow over his face, leaving me to face the little bride alone. “Umm…you’re marrying Daddy?” was all I could think of to say. “Yes. I like him and he likes me. And I already know him, so we can get married.” Certain logic there, no doubt, and I hated to break the news to her. “But, Baby Bear, Daddy’s already married,” I said and added, “To me.” Just in case that part wasn’t clear to our usually-precocious four-year-old. That decided, she took her place beside Kevin’s recliner and motioned for me to begin. I married us all together for always. “Mama, why did you say that?” She looked at me with questioning eyes when I hung up the phone. She’s not being stubborn or obtuse; I know she understands our situation. She simply doesn’t apply the rules and reality of death to it. Maybe it’s a coping mechanism; maybe it’s a way to deal with grief. I don’t know. And, honestly, in my heart, I agree with her. These new words feel so foreign: widow, single mom. I’m still wearing my rings. Kevin is still very much a part of our everyday lives. We talk about him, remember things about him, giggle about his silliness, kvetch over his picky eating habits – anyone listening to our conversations would assume he’s still alive and well and with us. But in my head? That’s a different story. Logically, I know that I’m a widow. I test the word out in my mind, roll it around. It doesn’t fit yet, doesn’t feel right. Doesn’t feel like an accurate definition of my life. Not when my life is so full of my baby Kev – she is so much like her Daddy, and not just in looks. With her around, he’s simply not gone yet, despite the fact that a very official death certificate is tucked away in the safe, ready to pull out when I need to legally verify his absence. No, I don’t really feel like a widow, but I do feel like a single mom. Some nights, panic grips me as I carry the Bear to my bed and lay down beside her. And in those moments, I imagine impossibly terrible things: What if I die in my sleep? What will happen when she wakes up? How long will it be before someone finds her alone? Will she call someone? Will she sit beside me, crying, telling me to please wake up? I pace through the dark house, afraid to sleep, crying, feeling like this weight of grief and panic will crush me. I can’t die, I cry out to God in those lonely hours, I can’t leave her alone. And in that cry, in that release of my fear, I finally feel a peace, I feel a presence. I feel His promise. You’re not going to leave her alone, He says. Just like you haven’t been left alone. I know you miss Kevin; I know you feel lonely and afraid. Yes, you are a single mom, but I am the Singular God. You are a widow, but I am the Wonderful Almighty. I will never leave you, never let you go. You don’t have to do this by yourself. I am always here, always holding your hand. And I’ve got her, too. I promise. You will always be together in Me. Trust me. I take a deep breath. I stop pacing. I lay down in my bed, beside my beautiful Bear and listen to her slow, even breathing. I reach out and tug a blanket over her shoulder. Then I close my eyes and let His promises cover me. Being a single mom is hard. It’s not what I imagined the day Kevin and I became parents to our incredible little girl. I never thought I’d be raising her by myself. I never imagined a life where he wasn’t on this parenting adventure with me, laughing and crying and trying to help our Bear make sense of this world. I never imagined we wouldn’t all be together for always. Every day I have to stop and take a deep breath. And another. And another. I feel God’s hand close around me. And I whisper, We’re all together for always. She paused, and her words hung silent in the room. Yes. Yes. Yes, my broken heart cried. A million times…yes. I knew she wasn’t judging me, or accusing me, or doing anything other than acknowledging the Kevin-sized hole in our life. It’s not just me – she feels it, too. We miss him, and as much as we fill our days with work and play and laughter and crazy cat antics, we crave his presence and we still can’t understand why he’s not here hanging out with us. Why did he have to die? Why do we have to live without him? I remember my first New Year’s Eve with Kevin. We were newly engaged, and he’d made reservations at a hotel’s dinner-and-dance party…where it turned out we were among the youngest people there. We laughed, and ate the delicious food, and danced to the live Glenn Miller-type band, and promised that we’d come back in thirty years to see if some other young couple had stumbled into the same delightful mistake. I didn’t know then that the clock had already started ticking for us, counting down the already-numbered and too-few days we’d get spend together. We looked forward that year, and there was no thought of making a deal with life and going back to a different time. The times behind were what brought us to each other – they’d served their purpose, and we didn’t want to go back. Then the New Year’s Eve I was pregnant with our Bear – we looked forward to the new year and our new life as a family of three, with new names: Mama and Daddy. The first New Year’s Eve after Kevin’s diagnosis, when the numbers were going in the right direction and it seemed like we’d won a few rounds of our battle with cancer – we looked for a year of respite, and maybe remission. Forward, forward, forward – always looking forward. Looking forward to time together, time with our Bear, just time…more time. And now? Well, now there’s too much time, and there’s a lot of truth in my girl’s late night musings. How many times have I begged for the same thing? The chance to make a deal with life? To only live the years I knew I would like? I knew on December 31, 2012, as I stood in the dimly-lit hospital hallway with the doctor, barely hearing the words he didn’t want to say, that 2013 was not a year I wanted to live in. I was right. And last New Year’s Eve, the idea of 2014 – a year where Kevin never was and never would be – it scared me. I didn’t know if I could do it, even with my little Bear dancing alongside, carrying her Daddy’s spirit wherever we went. And this year, with my constant companions, grief and loneliness, I stare into the future of another year without Kevin. And another. And another. Go back? Skip ahead? Where’s the place where I can be at peace again, and feel safe and loved and whole? Between the swirling uncertainty of the years ahead, and the solid loving comfortableness of the years behind, there’s one place I need to be right now. I know it – and as tempting as my daughter’s theoretical deal with life sounds, it’s not the answer for the aching loneliness and hesitation I feel in going on without Kevin. No, the place I need to be at the beginning of this new year, that place is right here – right here in the middle of this life that God is unfolding every day, guiding me along paths that He set in motion long ago. I will stand here, in this new year, even though I am unsure of the future, and I will stand watch, and find joy, and wait for God’s answers to all my questions. In the years before Kevin, I was vaguely aware of football. In my years with Kevin, it became such a part of my life that I automatically checked with him — and the Cowboys team schedule — before making plans during football season. In the years that I am in now — the years without my love — I am in a weird holding pattern. I know it’s football season, but I can’t bring myself to watch the games without Kevin. I miss the sounds of the raucous crowd and confident announcers blaring from the television; Sunday afternoons seem so bleak and quiet now. I miss hearing him yell, “Yeah, ‘Boys!” after a spectacular play. I miss a part of autumn that had been such a big part of my life, but has now fallen away, like the leaves from my sweet gum tree. I asked Kevin one time why there was a hole in the roof of the old Texas Stadium. Like a true Dallas Cowboys fan, he replied, “So God can watch His favorite team play.” And he wasn’t joking. I’m sure Kevin didn’t watch much football the year he was born, but he always found it exciting to recount that it was during that 1970 season that the Cowboys went to their first Super Bowl. He was less excited to admit that they lost in the final seconds to the Baltimore Colts. I teased him that if his first words had been “Go, Cowboys!” instead of “Mama” maybe the outcome would’ve been different. We started dating in August, and by the time football season started in September, we were in love and planning our future together. That’s when I learned our future would include football every Sunday…and occasionally Monday nights and Thursday nights, not to mention Thanksgiving Day. Go, Cowboys. I sometimes play a game with myself, trying to decide what day I would pick if I were offered the chance to spend one more day with him. Obvious contenders are our wedding day, the night our daughter was born, the night he proposed, and of course, those were all extraordinary moments of love, but I can’t discount the ordinary days of quiet joy. Like a cold winter Sunday afternoon. Home from church. Lounging on the couch in sweatpants and a Cowboys t-shirt. Listening to the announcers on the TV; their voices became as familiar to me as Kevin’s. I’d make it through the first quarter, a little longer, then around halftime, I’d lay over on the arm of the couch and let the roaring cheering crowd lull me to sleep. When Kev noticed, he’d get up and tuck a star-emblazoned team throw around me and kiss my forehead. And so we passed the lazy afternoon. Him watching the game with chips and a Dr. Pepper, and me dozing on the couch. Particularly great plays would rouse me briefly and I’d glance at him grinning broadly as the ‘Boys celebrated on the screen. “You look happy,” I’d murmur from the couch. “Hey, I’ve got a Cowboys game and my girl…I’m doing great, baby doll!” he’d exult from the recliner. When the little Bear joined our team, one of the first things he purchased for her was a Dallas Cowboys onesie, bib, and team logo baby bottle. When football season rolled around that year, a new family tradition was born: the Dallas Cowboys opening game day family portrait. I’d set up the tripod, we’d deck out in our team gear and pose on the front porch. 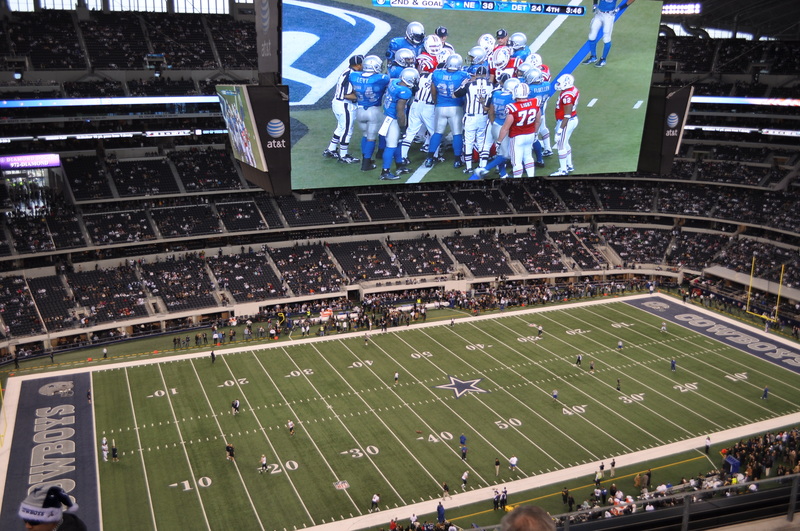 Go, Cowboys! It snuck up on me this year. I’ve never had to look up the football schedule before; that was Kevin’s job. I watched some leaves drift lazily to the ground one afternoon and it struck me that fall was coming and I panicked. What if I’d already missed the opening day? I cried, thinking that I might’ve blown it, that I might’ve let a family tradition die and how could I do that to Kevin? This past Sunday, we came home from church. She changed into her favorite team shirt and we set up the tripod and posed on the front porch. And it was sad and I was wistful and she remembered making silly faces on the “outtake” photos with Daddy last year, my two goofballs in front of the camera. I doubled over, rocking with grief and tears rolled down my cheeks, soaking into the laundry, and some of the numbness that’s been protecting me since April wore off and the pain of missing him was sharp and gut-wrenching. I couldn’t move; I couldn’t breathe. I couldn’t imagine a football season without Kevin here to watch it with me. And you wouldn’t think one more hole in the fabric of my life, which is already torn to shreds, would make a difference now but oh, it really does. The game played on and I cried, then quieted, letting the familiar sounds surround me and comfort me. The Cowboys beat the Giants and I roused myself enough to go whisper in my sleeping daughter’s ear “Hey, little Bear, the Cowboys won!” because that’s what her Daddy liked to do. In 2010, Kevin took a little break from chemo and we took a road trip with his family to Dallas for Thanksgiving. The Cowboys lost to the Saints that night, but Kevin was just thrilled to have been at the game.